The red earth of Karnataka's Bellary district has become a symbol of the region's red-hot iron ore market, witnessing an unprecedented boom. Bellary has been supplying iron ore to China for the last few years and the Chinese demand for the ore has spiralled like never before, ever since Beijing was chosen as the venue for the next Olympics. The town of Hospet in the district is abuzz with commercial activity. While large mining companies in Bellary-Hospet are expanding feverishly, smaller players are scrambling for all they can find. But unfortunately, amid all this commotion, concerns about agriculture, ecology, human health and labour laws have taken a back seat. "Ninety per cent of our production goes to China. We supply 10 per cent for domestic needs," says Sajjad Wahab, whose family owns the company Karignur Iron and Steel Private Limited operating in the region. Vibuthiguda Mines, another company, has increased production from 88,000 tonnes in 2001-2002 to 267,000 tonnes in 2004-2005. Mineral Sales Private Limited mines in Vysankere forest have sought an expansion of 500,000 tonnes. 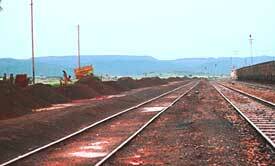 Bellary-Hospet contributed 25 million tonnes of the 80 million tonnes iron ore produced in India in 2004-2005. Karnataka's Department of Mines and Geology (domg) made Rs 260 crore from mining in 2004-2005; Rs 80 crore of this was from Bellary-Hospet. The iron ore, haematite, found in the district has a high 62 to 68 per cent iron content. Open cast iron ore mining is spread over 180 square kilometres in Bellary, Hospet and Sandur taluks. A study conducted by Karnataka State Remote Sensing Applications Centre in the three taluks reveals that between 1988 and 2000, there was a whopping increase in the mining area from 230.42 hectares (ha) to 820.46 ha. Feverish digging domg cannot explain the increase in digging. Its records reveal that four leases were sanctioned in 2000, six in 2001, seven between 2002 and 2003 and eight between 2003 and 2004. There are 68 working mines with leases in Bellary, of which three are public owned and the rest privately owned. The surge in exports has led to rampant land digging. The countryside is jotted with mounds of dug up earth. Men dig in plots of land, while women and children, some as young as three years, chip the ore to pieces. These illegal mines and crushing units are spread over several kilometers at Jambhunatha hill, outside Hospet. Also, three years of drought has increased the inflow of labour for land digging. "By digging just five to eight feet deep, iron ore is found ...So, everyone is turning to mining: doctors, cobblers, anyone with a little land," says BT Venkatesh, an advocate who has studied unorganised mining labour in the area. Agriculture, health suffer Agriculture is one of the worst sufferers of the unplanned mining expansion. "Over a period of time, the entire area got covered in mine waste. Agricultural cultivation was affected. From banana, betel nut and paddy, there was a shift to jowar, millets and cotton. Now, even this is grinding to a halt," says Venkatesh. "Before 1990s, we used to get good crop. Now, with all this dust, we have to increase our use of fertilisers and still the yield is poor," rues Jambumani Aryappa, tehsildar of Dhanapura, near Hospet. Over 202 ha agricultural land has been bought for a sponge iron plant in Aryappa's neighbouring village, Hanumanhalli. The price of agricultural land has surged in the region with a flurry of sponge iron units coming up; the Karnataka state pollution control board (kspcb) says 22 units were approved last year. Human health is another major sufferer of the mining mania. Red Alert, a documentary made by non-governmental organisation (ngo) Saki, records the health problems of mine workers. "We always have stomach pain. With every gulp of tea, we take in dust," laments a worker. The area has high incidence of lung infections, heart ailments and cancer. Complaints of air pollution are also common, but kspcb remains unmoved. "The only problem is dust during transportation, but there are no basic standards fixed and so we cannot take any action," argues kspcb environment officer C M Satish. A 2002 study by National Environmental Engineering Research Institute (neeri), Nagpur, found suspended particulate matter at many locations in Sandur between 130 microgramme per metre cube (g/m<>) and 1,678 g/m<>. The maximum observed concentration was 4,474 g/m<>, but it was within the norms prescribed by the Directorate General of Mines Safety (5,000 g/m<>). On its part, kspcb has neither found violations, nor issued any notice to any mine under the Air Act, 1981 or the Water Act, 1974. Studies point at siltation in the Tungabhadra reservoir due to mining activities. "The total capacity of the reservoir was 133 thousand million cubic metre (tmc) but now it is only 99 tmc. The rest has been destroyed by silt," says Virupaksha Naik of Jagratha Nayaka Balaga, an ngo. Another problem is that the clamour for exports leaves a very small percentage of iron ore for the domestic market. "Even Jindal, Kalyani and Kirloskar steel plants are beginning to feel the pinch, because they are not getting adequate raw material," says S S Hiremath, deputy director, domg. Mining has also negatively impacted the Vysankere forest and the Bellary reserve forest by fragmenting them. The dumping of waste material has caused a loss of topsoil in Bellary forest, but the forest department is not too ruffled. "This is a dry zone forest. With god's grace, we have lots of iron. We are compensated for the land and given money for afforestation," says deputy forest conservator Manoj Kumar Shukla. But many in the area still remember the mining belt as a forest area. Venkatesh points out that while the district is dry, this area receives the highest rainfall of around 900 millimetres. Labourers work for as low as Rs 7 for a basket of broken stones. "Despite their abject poverty, health status and working condition, their employment is touted as a sign of development," points out A Bhagya lakshmi, member of a fact-finding committee on child labour in the region, set up by Mines Minerals and People, a coalition of individuals, institutions and communities working against the adverse effects of mining. The committee reported that an "alarming number" of child labourers are employed in the mines. Most are children of migrant labourers, though some children from Bellary villages also work. All these children are susceptible to chronic health problems, as they handle toxic materials and are exposed to high levels of dust. "After the report, which urges the government to conduct an inquiry, the district commissioner went checking and declared there is no child labour in the region. He said the children merely play in the area when their parents work," laments Bhagyalakshmi. Based on neeri's environmental impact assessment, the Union ministry of environment and forests had directed the state government to ensure that new mining leases are considered only if the area concerned is over 5 ha and a detailed report about it is available from the Indian Bureau of Mines. Small mines, less than 5 ha, damage the environment and do not come under the Mines and Minerals Development and Regulation Act, 1957 . The state government was also asked to identify common dumping areas for mine waste and carry out a detailed groundwater study. Neither of the instructions was followed. But domg has called for a check on grant of leases in Hospet region. While the Minerals and Metals Trading Corporation (mmtc) calls for a check on iron ore exports and encouragement to the domestic sector, the State of Environment report of Karnataka, 2003, points to the need to seal production, with no further expansion. Till April 2002, mmtc was the sole exporter of iron ore. But since then, a number of exporters have surfaced. "Our supplies are becoming less and less, now that export licenses are given so easily," complains R C Podeti, senior manager, mmtc, Hospet. Aided by the iron ore money, many mine owners contested the 2004 elections and became legislators. With mining interests and political clout joining hands, it is now widely believed that only legislative changes can save the region from unbridled mining.